Gratitude is the poster child of the mindful life brigade, but this husband proves that simply paying attention could prove just as life-affirming and relationship-improving. Twitter user and author, TechnicallyRon explains it better than we ever could. 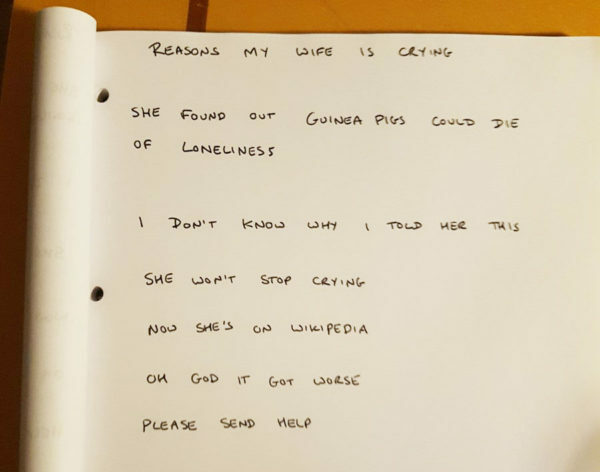 “My wife cries at absolutely anything. I mean, ANYTHING. So I started writing the reasons down because reasons,” he posted on Twitter with an accompanying snapshot of his work-in-progress list. She found out swans can be gay and thought it was really nice. She was hungover and saw a picture of a piglet. I waited until it was dark and pretended to be the Babadook. The fluffy bunny escaped from an Arctic fox in a documentary. There were no biscuits in the house. 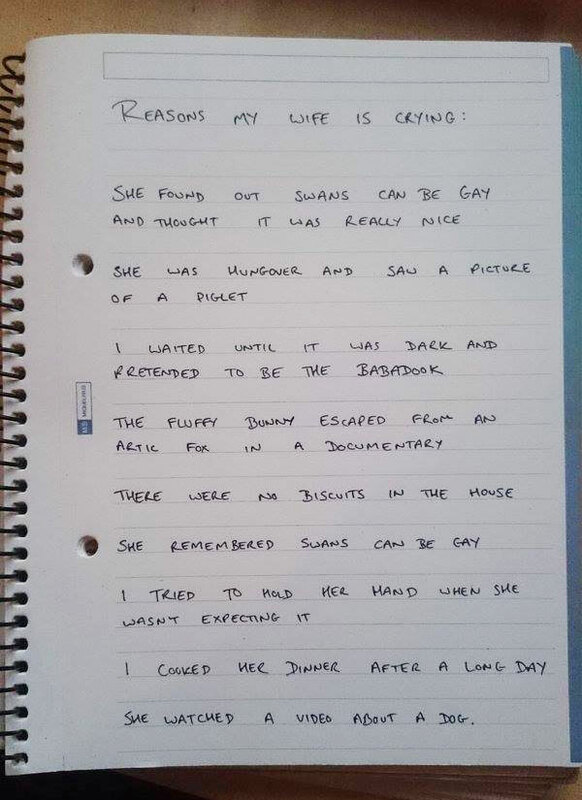 She remembered swans can be gay. I tried to hold her hand when she wasn’t expecting it. I cooked her dinner after a long day. She watched a video about a dog. This opened the floodgates, of course, as others revealed similarly serious reasons for having a good sob. We KNOW you want to know what they were. Here are some of them. You. Are. Welcome. I just cried at a small horse pulling a cart. (My wife cried because I was) pretending to throw a rat at her. I cried the other night because my husband wanted ice cream but I’d eaten it all. (My wife cried because I) jumped out of a box while she was moving house. My wife cries when we watch a cartoon with an extinct animal in it. Ice Age is right out. My daughter-in-law cried in a teashop because ‘all the pretty teapots’. As someone who cries at flashmobs, people opening mail, strangers being reunited at airports, animals helping other animals and people doing kind things, I totally understand this man’s wife. Further, I consider everything on the list completely sob-worthy and extremely emotional and am certain she is a very good egg. In the spirit of this heartfelt and sustained sobbing, I’m going to watch a video of a piglet now.